How to use it with a modular system and its benefit to laboratory throughput. The IDEXX RealPCR™ real-time PCR reagents aim to provide a new level of standardization to PCR diagnostics by offering modular reagents. The components of the modular platform are shared over the entire platform, making it possible to run any pathogen-specific mix with a standard master mix and a single positive control. Moreover, the RealPCR modular platform maintains a single PCR cycling program for all DNA and RNA targets, enabling reactions for multiple targets to be performed simultaneously. Real-time polymerase chain reaction (PCR) has revolutionized diagnostic testing over the past decade, and is currently used in a variety of diagnostic applications worldwide. While real-time PCR has offered significant advantages over end- point PCR, commercial real-time PCR assays still use a set of reagents, or “kit”, designed for testing a precise number of samples for a specific target(s). This approach often requires a separate testing protocol for each target, increasing time to results and hands-on time for laboratories. IDEXX RealPCR reagents are designed to work as a modular platform. Thus, the RealPCR DNA or RNA master mixes may be used with any of the respective DNA or RNA RealPCR target mixes. Additionally, a single pooled positive control works as a PC for any RealPCR assay. To increase testing efficiency, all RealPCR reagents are designed to utilize a single cycling protocol allowing DNA and RNA assays to be run side-by-side. Finally, when suitable, the IDEXX RealPCR reagents utilize an internal sample control (ISC) for the detection of endogenous host DNA or RNA. The ISC performs the same function as an internal positive control (IPC) but also confirms sample quality and collection while not requiring a separate spiking step. The RealPCR Lab Monitoring reagents provide additional tools for environmental contamination monitoring programs. The RealPCR PC Tracker DNA Mix specifically identifies positive control contamination in laboratories, while the RealPCR Signal Check DNA Mix is useful as a positive control when running environmental control samples. As an early offering to this modular platform, multiplexed, real- time PCR reagents have been developed for the simultaneous detection and differentiation of DNA from two avian pathogens, Mycoplasma gallisepticum (MG) and Mycoplasma synoviae (MS). Sequences unique to either MG or MS were previously identified (1). Primers and probes were designed to amplify and detect the presence of these target sequences in a multiplex format while also conforming to the RealPCR cycling protocol. For the ISC, a sequence conserved between chickens and turkeys but unique from all other sequences currently residing in the NCBI database (http://blast.ncbi.nlm.nih.gov/) was identified and primers and a probe were designed to amplify and detect the presence of this sequence. Quantified synthetic DNA representing target sequences unique to either MG, MS or the ISC target were used. Sequences were individually diluted in 10- fold increments to obtain 10 copies per 5 μL. Amplification reactions were performed in a total volume of 25 μL, with all samples tested in triplicate. Each reaction contained 10 μL of both RealPCR DNA Master Mix and RealPCR MG/MS Multiplex DNA Mix, and 5 μL of sample. Reactions were incubated at 50°C for 15 min, 95°C for one min followed by 45 cycles of 95°C for 15 s and 60°C for 30 s with fluorescent signals taken at the end of each extension step in the FAM, HEX, and Cy5 channels. To determine the efficiency of the RealPCR MG/MS Multiplex DNA test, diluted synthetic MG or MS target was tested over an 8-log range starting with 10 copies of target per reaction up to 108 copies per reaction, in triplicate, to generate a standard curve. The MG and MS reactions each detected all three 10 copy per reaction replicates and exhibited efficiencies of 99.9% with correlation coefficients of 0.998 or greater. Additionally, the ISC reaction had an efficiency of 96.4% with a correlation coefficient of 0.989 (data not shown). This testing demonstrates high efficiency for all three targets and confirms the reagents perform as expected using the RealPCR cycling conditions. The RealPCR MG/MS Multiplex DNA reagents detected ISC in 100% of all samples tested, regardless of the purification method, demonstrating the effectiveness and robustness of the design. The IDEXX RealPCR modular platform allows the user to include different assays in a single PCR plate, overcoming the limitation of low volume sample sets delaying a PCR run for the laboratory, making it efficient to include low volume PCR assays into the same run as a high volume assay. 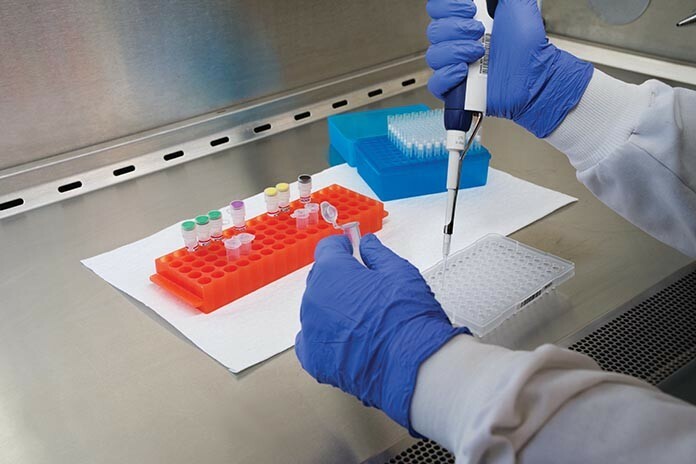 Smaller laboratories might also find PCR testing more feasible with the use of this system, since total sample numbers for a PCR run are not assay- dependent. Moreover, the use of modular components makes the introduction of new assays easier. Following the IDEXX RealPCR modular platform, the MG and MS real-time PCR multiplex reagents demonstrate high efficiency and robust performance with different sample types. We believe the shared reagents and standardized testing of the IDEXX RealPCR modular platform will greatly increase efficiency, while decreasing real-time PCR results turnaround time for many diagnostic laboratories. Raviv, Ziv, and Stanley H. Kleven. “The development of diagnostic real-time TaqMan PCRs for the four pathogenic avian mycoplasmas.” Avian diseases 53.1 (2009): 103-107.